The release of a joint effort between two artists should raise questions. Why these two artists? What is the nature of the relativity between their works? Is it the contrast? Is it the similarity? Maybe it is the concept? I need to get to the bottom of this fine release by the label “Against it”, who, in the brief time of its existence, has managed to release many interesting albums in different genres, with this falling to the more experimental category. Taking the left corner is R.J Schrey with one track that is just over twenty minutes long. On the right corner we have Christina, A.K.A IOIOI, with four tracks of her own. The last track is untitled and we have no information about it whatsoever. A little mystery never hurts. As the albums plays over and over again, I come to realize the nature of relationships between the two parts of the album, as well as the connection between the different tracks. “Breakdown” is the sound of disaster, a point of distress, and the following steps are the aftermath, the healing process of this powerful event. The opening “Breakdown” is quite a remarkable entrance. Within the twenty minutes of its duration, Schrey is slowly going through many different phases, resulting in a dreamy landscape that eventually becomes a nightmarish, claustrophobic encounter. Epic sounds flow slowly and without noticing change shape to broken, paranoid chanting. The heart races along with the steady percussion development, switching to different scenery from the one we began with. Onward into “Breakdown”, this schizophrenic state reaches extreme points when we hear something between howling and pleas for help, mixed with menacing drones and haunted shrieks. It’s a rich experience, in which Schrey keeps adding more and more pressure on the mind, trying to induce some sort of a mental breakdown, or maybe to picture such a broken state of being with sound. When it ends, the first sounds of IOIOI emerge. Her first track, “Sia”, is only a little longer than one minute. Its wide variety of percussion sounds sets new ground and new rules for what lies after Schrey’s departing. Little by little we get to hear more sounds on her other tracks. These sounds build a new landscape for us; an alternate picture. On “Cosi Sia” IOIOI brings distant sounds and shapes them into form, almost as if using scarce remains of sound, those that were not destroyed earlier by Schrey. Her world is stunning and almost visual, and in “Amen” her haunting sounds grow solid and impossible to ignore. R.J Schrey opened with a very impressive track, and IOIOI shows an equal display of power. “The healing breakdown” starts and ends in a very impressive manner, showing great thinking and feeling behind its various moves. 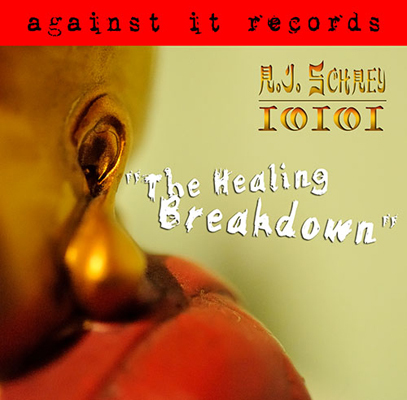 Both Schrey and IOIOI prove to be very interesting artists, and as they work together on this album, the listener can hear how natural their connection is. This connection is greatly appreciated, as it led to a powerful and, at points, monumental album. Excellent.